Global Climate Change and Human Health examines the environmental crisis from a public health and clinical health perspective, giving students and clinicians the information they need to prepare for the future of health care. 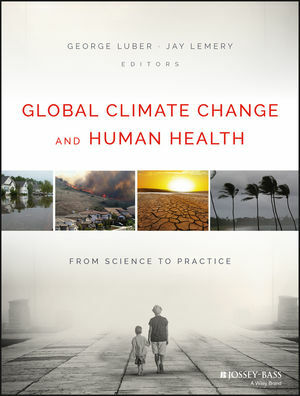 Edited by George Luber, associate director for climate change at the Centers for Disease Control and Prevention, and Jay Lemery, associate professor at the University of Colorado School of Medicine and section chief of Wilderness and Environmental Medicine in the Department of Emergency Medicine, and including chapters written by luminaries in the field, this landmark book provides a comprehensive introduction to climate change and health. Students will learn about climate changes direct effect on health, including extreme weather events, altered and degraded ecosystems, and threats to human security and welfare. Discussions on mitigation and adaptation strategies, including disease surveillance, communications, and greening health care, as well as a primer on the core concepts of climate change science are presented. Each chapter has a specific section on the clinical correlations of the impact of climate change on health. Informative illustrations depict increasing aeroallergens, shifting vector habitats, emergent risks, and more. Visual teaching materials broken down by chapter (including PowerPoint lecture slides) are available for instructors. This book shows how human health will be —and already has been — affected and how health care practitioners need to start preparing. Increased temperatures bring algal blooms that threaten clean water. Degraded air quality brings allergies, asthma, and respiratory diseases. Ground pollutants lower the nutritional value of food crops. It's clear that climate change is very much a public health concern, and Global Climate Change and Human Health helps those preparing to be on the front lines of health care. GEORGE LUBER, PHD, is chief of the Climate and Health Program at the National Center for Environmental Health, Centers for Disease Control and Prevention (CDC). JAY LEMERY, MD, is associate professor at the University of Colorado School of Medicine and section chief of Wilderness and Environmental Medicine in the Department of Emergency Medicine.